A new year, a new university and a new class group. Everyone gathered promptly at 8:00 pm in TU Dublin’s SL campus for the first class of 2019. 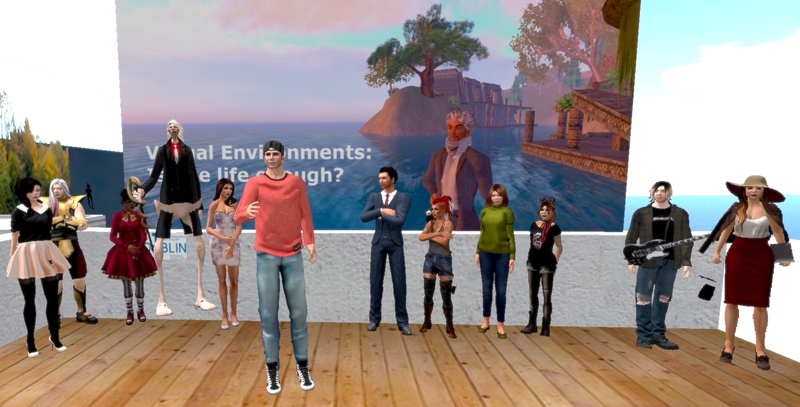 All students were set up with their shiny new avatars, voices activated and ready to learn – a really great start to the module! We started off by making friends with each other. This enables us to see if class members are online in SL and to communicate by text when someone is in a different location in SL. John also invited you to join the module group so you are registered as module participants. This will allow you to access the classroom building and also supports notifications and other group communication. John also confirmed everyone’s SL name and matched it to your Real Life (RL) name and student number. Then we all trooped out to the balcony to stretch our legs (well, our avatars’ legs) and took the class photo. This demonstrated that you all have a high level of avatar dexterity – you would be surprised how difficult it can be to get avatars to post for a photo! When we settled back into class John talked about the format of the module. Class time is for discussion and, to prepare for that, you will need to read the assigned texts (or view the videos) in advance. This will ensure the discussion is informed and reflective. You will also need to plan for visiting SL between classes to complete the assignments and, after class 4, work on the Team Project. While we didn’t discuss online etiquette explicitly you were all very good at giving confirmation of your presence, for instance, typing ‘Y’ when asked if you understood what was being said. Avatars do not do body language very well so positive reinforcement is something you need to be aware of constantly. One of the easiest and most immediate ways of providing feedback is through text messages in ‘local chat’. For example, you can type ‘Acuppa Tae nods in agreement’ or ‘coldtoesies has a puzzled look on her face’. This approach supports the discursive nature of the class and ensures everyone remains engaged. The new Virtual Learning Environment at TU Dublin, Brightspace, is being piloted for this module so John asked for feedback on how it is working – feel free to be as critical as you need to be. Review the section for the next class well in advance to familiarise yourself with the content. Use the short quizzes to check if you understand the topic and don’t forget to do the assignments set after each class meeting. Finally, John reminded you that while these class summaries are useful they do not replace class attendance! You are currently browsing the archives for the 2019 class summaries category.